Tax season is upon us. By now you have most likely begun to collect your W2’s, 1099’s, and tax receipts for the previous year. If you purchased new windows in 2013, we have good news for you. The federal government has extended the tax credit offered in 2012 to 2013 as well. You may be able to take the credits if you made “energy saving improvements” to your home located in the United States in 2013. 10% of the cost, up to $500; windows are capped at $200. Must be ENERGY STAR qualified. You do not have to replace all the windows/doors/skylights in your home to qualify. And it doesn’t need to be a replacement either – installing a new window where there wasn’t one previously (like in an addition) qualifies. 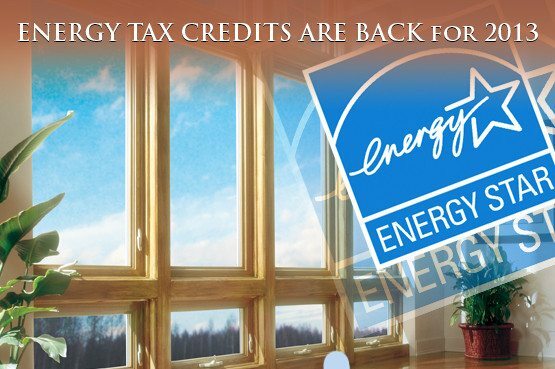 Tax Credit does NOT include installation costs. Must be an existing home & your principal residence. New construction and rentals do not qualify. Download Tax Form 5695 right here and get started claiming your credit!